I'm excited as I am driving down to The Highlands tomorrow for the artist's reception and talk at the Bascom Center for the Visual Arts. Charles Gandy is a member of the Master Committee and a very dear friend. I am looking forward to it. Here is the link: Beyond the Sock. I hope they allow photographs! If they do, I will post some in my next entry. It has been a while since I put in an obligatory cat photo. Here is my sweet, blind Petipa. It has been very slow! I know it is spring but send me some lessons! This topic is in response to a request. A fairly new knitter contacted me when they were confused by some language in a pattern. It had to do with how often to work increases and decreases. When I was reviewing swatches for the Masters Hand Knitting program, I noticed that this was a very common problem. 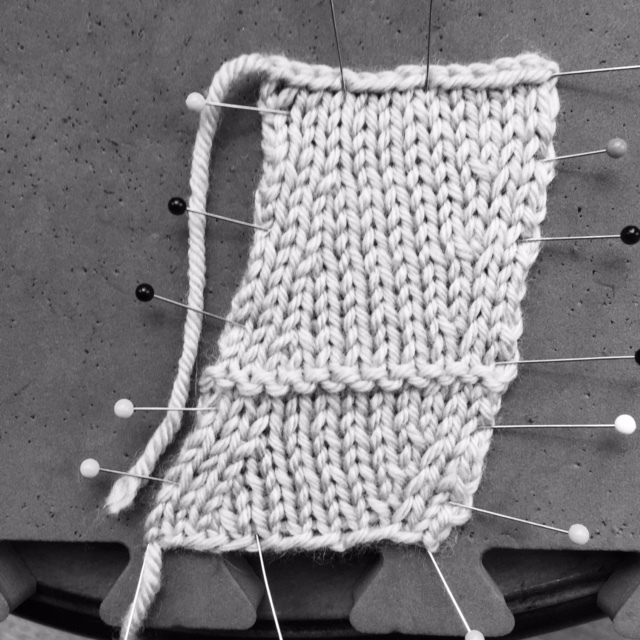 The instructions for a group of swatches specified to work the increases and decreases every other RS row but invariably the knitter would work them every RS row. Naturally, this impacts the length of the piece. The bottom portion of the swatch in the photograph below shows the increases worked every RS row and the top portion, every OTHER RS row. Generally you see instructions like this when shaping a sleeve or a neckline and it is important that you get it right or you won't get the expected results. This process is described a variety of ways in patterns. In circular knitting, it will never be phrases as every RS or every other RS round as all the rows are RS. The language you see in these cases is "Dec every 2nd (or 4th) round." You see this in flat knitter as well and it can be confusing. It helped me to write it out. Dec Round: Make the dec.
Second Round AND Dec Round: Make the dec. This is how to interpret "every 4th row". Fourth Round AND Dec Rnd: Make the dec. This photograph shows how to place increases and decreases every other RS row or every 4th row. Again, the arrows show the increase/decrease row. Many knitters do not know how to "read" their work and when I teach I frequently discover my students misidentify the actual increase/decrease rows. In the two photographs below, the BLUE arrows show the row on the needles when you make the increase/decrease. The actual increase/decrease row is indicated by the red arrows. It is important that you be able to identify increase and decrease rows. If you put your work down you need to be able to see when you need to work the next increase/decrease row. By the way, the increases are right slanting lifted increases. There won't be salon this week as I will be in North Carolina but there will be one the week after, May 1st, 1:30-3:20. I'm just finishing up the sweater for Elff. I just have to do the seams & hem now. It is a good thing. I am starting to get the yarns for garments for Cast On. Yes, its that time of year again. Boxes are arriving daily and I am hoping to keep up. For anyone who is new to this blog, we have a Yarn Tasting at our annual TKGA conference. Last year we had over 30 different yarns to taste. Because I am nuts, we wind the yarn into small, center-pull balls with individual labels for each participants (100). It is a pain but I can't really think of another way to manage the yarn. I've been getting quite a few lessons lately and I have been keeping up. Again, if you could send me an email with a tracking number when you send the package, I'd appreciate it. I've decided to discuss working Fair Isle (or stranded) designs flat. The traditional method is that it is done in the round and then steeked for the armholes or fronts if it is a cardigan. The key advantage is that you are always looking at the RS and you never have to purl. The disadvantage is that side seams often provide support for a garment and you will have jogs in the pattern where the round begins and ends. I've always preferred working stranded designs flat for very personal reasons. The main one is that my tension is much better. When I am knitting a tube I seem to strand tighter (and yes, I know that you can turn the work so that the strands are on the outside). I also like the support of the seams at the sides. Plus I can line up the pattern exactly. I've taken a lot of flak in for my construction. My favorite was the 9 paragraph email that began "Oh why Oh why would you work this flat?" If you like one of my designs and you want to work it in the round, just subtract the selvedge stitches and work the front and back together. The problem with working it flat is the selvedges. Initially I would only have one stitch at each side and have to do sort of an intarsia wrap thing which left a lot to be desired. I then figured out if I had two selvedge stitches and alternated them every row I could solve this problem. Yes, the selvedge stitches are ugly but they will be in a seam. I also recommend using two hands to work. I always keep my background color in my right hand (and I keep this strand on the top) and my design colors in my left (which I keep below). I'm not going into color dominance theory as it is too big a topic for this discussion but trust me, you work will look better if you do this. I will be out of town this weekend so the next salon will be April 17th. I am STILL working on the sweater for Elff. I am hoping to finish it up this week in time to start on the stuff I will be doing for Cast On. I'm on the second sleeve!!! Fair Isle Flat in action.